Colin Firth poses with the for Leading Actor for the film 'The King's Speech' during the Orange British Academy Film Awards at The Royal Opera House on February 13, 2011 in London, England. Royal drama "The King's Speech" was crowned the big winner Sunday at Britain's top film awards — a sign that it may reign again at Hollywood's Academy Awards in two weeks' time. The made-in-England story of King George VI and his struggle to overcome a stutter won seven prizes, including best picture and acting trophies for Colin Firth, Helena Bonham Carter and Geoffrey Rush. It had to share the crown jewels with Facebook-founding drama "The Social Network, which took three prizes including best director for David Fincher. Mind-bending saga "Inception" also won three trophies. "The King's Speech" went into the awards as heavy favorite with 14 nominations — an unexpected British triumph that cost a reported 15 million pounds ($24 million) to make and has taken many times that at the global box office. It beat "The Social Network," "Black Swan," "Inception" and "True Grit" to the best picture prize. Perfectly timed in a year that sees the royal wedding of Prince William and Kate Middleton, the movie tells the true story of George VI, thrust unexpectedly onto the throne by his elder brother's abdication, and his battle to overcome a stammer with the help of an unconventional speech therapist. Screenwriter David Seidler said he was astonished that this small film about "two men in a room" had been so popular around the world. "I don't think it's the fascination with royalty," Seidler said. "I don't think it's the ostrich plumes and the gold braid. I think it's the fact that it's a story about changing your destiny." The British-American writer, who overcame a childhood stammer and has worked on the screenplay for 30 years, said that "for a stutterer … to be heard is a wonderful thing." 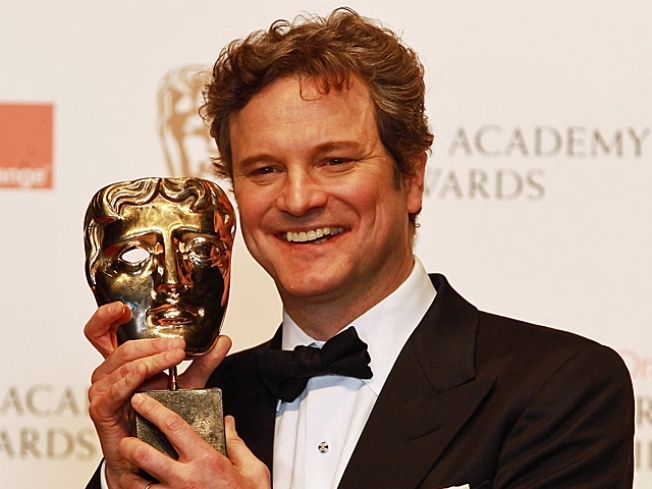 As expected, Firth won best actor for his portrayal of the reluctant monarch. He has already won a best actor trophy at the Golden Globes and is a favorite for an Oscar. "I like coming here," said Firth, who won the same prize last year for "A Single Man." "The King's Speech" also took awards for best British film, original screenplay, original music, supporting actor for Rush's turn as speech therapist Lionel Logue and supporting actress, for Bonham Carter's performance as the Queen Mother Elizabeth. "I think I should thank the royal family, frankly, because they've done wonders for my career," Bonham Carter said. Bonham Carter, who also recently played the giant-craniumed Red Queen in husband Tim Burton's "Alice in Wonderland," joked that "I seem to be playing queens with ever-decreasing head sizes." Natalie Portman won the best actress prize for psychosexual dance thriller "Black Swan," its only win from 12 nominations. "The Social Network" took directing and editing prizes, as well as an award for Aaron Sorkin's adapted screenplay. "Inception" won prizes for sound, production design and visual effects. Writer-director Chris Morris took the prize for best British debut for "Four Lions," his comedy about a group of bumbling would-be suicide bombers. Swedish thriller "The Girl With the Dragon Tattoo" was named best foreign language film. Producer Soeren Staermose joked that its no-holds-barred heroine, Lisbeth Salander, was "the scariest thing to come out of Sweden since ABBA." Most of the winners are selected by the votes of 6,000 academy members. Actor Tom Hardy won the Rising Star Award, decided by public vote. The awards, known as BAFTAs, are considered a strong indicator of possible Oscars glory. Last year, Iraq war drama "The Hurt Locker" won six BAFTAs, including best picture — then repeated the feat at the Oscars. Sunday's ceremony provided a mix of British style and Hollywood glamour. Stars including Samuel L. Jackson, Mark Ruffalo, Neve Campbell, Barbara Hershey and Bonham Carter — in a black Vivienne Westwood dress — braved a blustery London drizzle to walk the red carpet at London's Royal Opera House before the televised show. Britain's movie industry is facing uncertainty amid an economic slowdown and government funding cuts. "The King's Speech" was partly funded by the U.K. Film Council, a body recently abolished by the country's Conservative-led government. The ceremony tried to lift the mood and celebrate British success, giving an award to the money-minting "Harry Potter" franchise for outstanding British contribution to cinema. Christopher Lee, the aristocratic 88-year-old actor who chilled generations as Count Dracula in a series of Hammer Studios horror classics, received a lifetime achievement award. PLAY IT NOW: Nicole Kidman Discusses Her Childhood Stutter: How'd She Get Over It?